This anime sounded a bit interesting to me so I decided to watch it. It is truly an adorable anime with cuteness for miles on end in each and every episode. I did also quite enjoy the sort of pervy element and everything that came with it. This is a very adorable show that has likable characters, good pacing, humor, and some nice lolis to boot. I was immediately hooked by the art style and the cute characters; the hilarious relationships and quirks of the characters were an added bonus. Throughout the series, I saw negative reactions to the relationship between Hana and Miyako; I thought it was cute and funny and didn't see it in a weird way. Also, the fact that there was lots of baking of sweets made this series all the more better; I'd definitely re-watch this series as a pick-me-up with how sweet and cute the whole anime was. #268. Press X to Mya-Nee! Miyako Hoshino is a timid introverted college student, who spends most of her time at home. Her fifth grade little sister Hinata Hoshino, who is quite the opposite of her, brings her friend Hana Shirosaki to their house. Miyako manages not only to get along with Hana, but also has fallen in love with her. Whether it is some form of excitement from having a friend in her life, or suppressed "lolicon" desires, honestly, I have no idea. Regardless, this is anime is the antics of their daily lives. Every season we get at least one of "those" anime. Ya know, that one anime that is part of the "cute girls do cute things" sub genre. However, they don't really do anything to change up the formula or stand out. Wataten! an Angel Flew Down to Me, manages to do even less, somehow... The answer though is far from confusing, you see, cute girls do cute things anime... Well... It just works. It does help that the anime itself has a surprisingly good animation style and quality, coupled with the grade school kids performance, Hinata absolutely steals the show most of the time she is on screen. 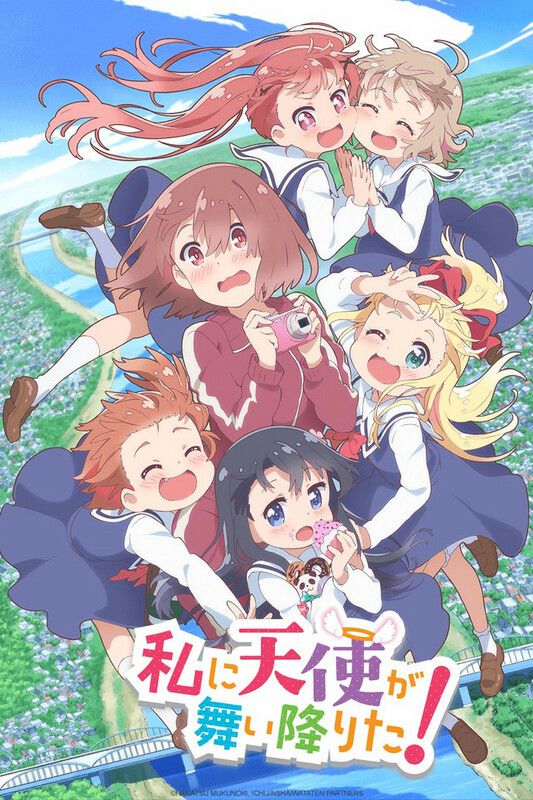 If I were to compare this anime to another, or specifically call out an anime last season that is ridiculously close in not only premise but also "plot" progression to Wataten! That anime would be last season's UzaMaid! (It was also made by the same studio, Doga Kobo) Now to this anime's credit, I wasn't able to finish UzaMaid! last season, dropping it after six episodes. My personal review policy is to never write a review for something I didn't finish, so I think that alone should speak to how much more I enjoyed Wataten! If you can get past the hints of "lolicon" early on in the show, and the sometimes bland moments, it is at the least, a harmless slice of life anime simply about cute girls doing cute things. Filled with plenty of cute moments, "Mya-Nee! ", and surprisingly even some self aware humor spread throughout. Ultimately it's up to your tastes, and your call to put this on your queue. This show, honestly, is trash. If you look at this show and think it's entirely wholesome, you must be high or this shows targeted demographic. The people who gave this show five stars are correct in a way, it is a cute show, with cute characters, cute imagery, cute colors, etc. However, if you are a well adjusted human being who knows to not invite kids into your white van promising candy, this show will weird you out from time to time. That being said, when looking at this show as a psychological show instead of a romcom, you might find it to be a bit more intriguing. As a person who usually freaks out and gets uncomfortable with the pedo stuff this def did raise some flags for me at first. However I just suggest to keep trying and watching. It is a cute show and sometimes you will get uncomfortable with how Miyako reacts to Hana but after maybe 4 episodes the shock value goes away and you're left with something amazing that will melt your troubles away. Wataten is a good anime. From episode 1 to 7 i thouroughly enjoyed the anime. It is cute and simple, not alot of characters and a basic story (if you can call it that). I enjoyed it and thought it is worth a watch. I hope they release more episodes in the future and that they do not stop now.